With the holidays quickly approaching, you may be in the mood to start putting up your outside Christmas decorations. Head outside on a relatively warm day and decide what type of decorations you’re going to be hanging this year. From Christmas lights to wreaths, bows and garland, there are so many different types of decorations to choose from. Show off your holiday spirit by installing lights and more on your homes vinyl siding. This approach works just as well on metal siding as it does for vinyl. If you are unsure of how to install Christmas lighting and decorations on your home, simply follow this guide to make your day a little bit easier. 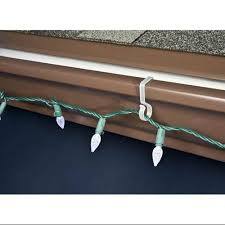 One of the easiest ways to install Christmas lights on vinyl siding it to take advantage of gutter clips like in the picture above. These type of clips can be purchased at your local hardware store or retailer that specializes in Christmas decorations. Plastic gutter clips are easily able to snap onto your gutter without causing any damage to the siding of your home. To get started, you will first want to make sure that you have enough lights to string across your chosen space. Get your lights and other materials ready, including a ladder, at least two gutter clips for every foot of lights, an extension cord and pliers. Check to ensure that your lights are working before installing them. Before installing your Christmas lighting on your vinyl siding, you will want to make sure that all bulbs are lit. If any bulbs are not working, simply use your needle nose pliers to pull the dead bulb out at the base and install a new bulb. If you do not have any extra bulbs, these can typically be purchased at your local hardware store during the holiday season. After you have ensured that your lights are all in proper working condition and you have untangled the strings of lights, it’s time to climb up your ladder in a safe and sturdy spot to start installing your gutter clips along with lights. Place your gutter clips about every six inches along your siding. These clips easily snap on to your gutter, providing a hook to hang your lights from. Continue to move the ladder along the side of your home until you have installed all gutter clips. Next, repeat this process by moving your ladder along the side of your house while hanging the lights from the gutter clips that you have already put on. Connect your lights to an extension cord to bring them to a power source to complete the decoration process. Decorations on the Siding We have just discussed the easiest way to hang lights.”Gutter Clips” Now what do you do if your plan includes hanging wreaths, lights or any other decoration that you can think of right on the siding. rule number one is try to avoid putting holes in the siding. 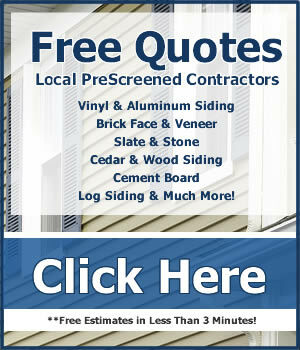 Unlike wood siding where you can nail or screw right into it. Vinyl and Aluminum siding does not like holes. Water tends to find a way in behind and can damage the insulation or build up ice and push the siding out. So what are you supposed to do to hang that special decoration? The same as you do with gutters there are clips designed just for siding. Just like we showed you with the gutter hooks you can get siding hooks at your local hardware store as well. Watch this Vinyl Siding Clip Installation Video for a sample of how they work. You can also consider using an adhesive stick on clip. I have found they do not hold as well in real cold weather. If you are doing aluminum siding you could check out magnetic clips for your projects. Installing Christmas lights and decorations on siding is simple! Clips are available for a wide variety of lights including icicle lights and C6 bulbs.